The ‘430 creates a voice-activated system allowing the player to control his animated character not just with the physical controller, but with his vocal commands as well. The voice processing method detects the player’s voice tone and then analyzes the meaning and the detected voice level. The system also provides a tendency detection means which detects voice tone and helps the game recognize what command is being spoken. 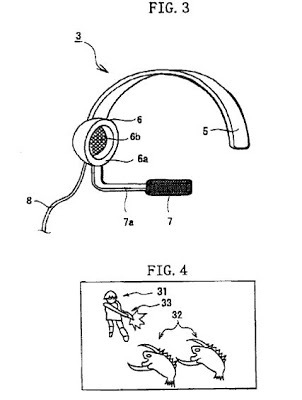 The present invention detects a voice tone of a player based on input voice information, and then outputs voice data having a voice tone corresponded to the detected voice tone as voice data of an object, to thereby allow the player to operate a game object through voice input. 1. A voice processing method comprising the steps of: detecting a voice tone based on inputted voice information; determining a plurality of groups corresponding to a plurality of voice data; classifying the detected voice tone into at least one of the plurality of groups; and outputting voice data whose voice tone corresponds to the detected voice tone; wherein the step of outputting voice data outputs voice data corresponding to the at least one group if a count of voice tones classified for the at least one group exceeds a predetermined number.